New!! A 275-count empty acorn capsules pack at the price of a 250-count acorn capsule pack!! Avend's industry-standard 1.1 inch gumball machine containers are designed to hold candy, rings, stickers, charms, bracelets, balloons, dice and any other small prize or reward. Each acorn vending capsule is approx. 1.1 inches in diameter and stands approx 1.25 inches tall with the colored lid on. Each vending machine capsule is made up of a soft plastic clear frosted bottom and a colored top. The huge selection of colored lids are premixed and packaged at random. The selected colors within each Avend gumball capsule assortment pack will vary. These fun acorn vending machine capsules come empty and unassembled; ready to be filled with your favorite prizes and toys. Each Avend plastic vending machine capsules assortment pack is bulk packaged in a clear plastic bag with an Avend label and 275 clear frosted bottoms and 275 mulit-colored lids. Avend acorn empty capsules assortment packs by Mid Cities Sales give you an excellent selection at a very affordable price! We are a small company that values every single customer. Let us earn your business today! 100% Satisfaction Guaranteed! Mid Cities Sales also offers Avend 2-INCH Guaranteed 7-Color Variety Packs. See Mid Cities Sales other capsule listings for more details on Avend products. AN EXCELLENT ASSORTMENT of acorn capsules in every package! Our NEW 275-count vending machine capsules for gumball machines includes a nice selection of 1.1 inch industry-standard colored vending capsule lids and clear bottoms. SOFT PLASTIC vending capsules provide greater safety than brittle polystyrene plastic containers. 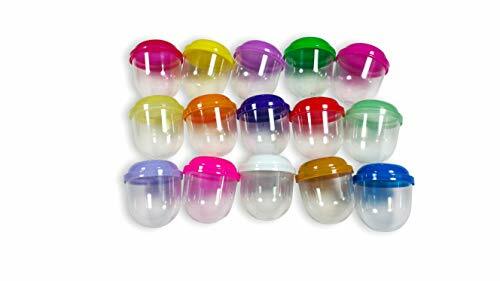 Our tight fitting colored lids provide secure toy capsules. EXCITE YOUR KIDS AND STUDENTS in school, on holidays and at birthday parties with these prize capsules designed for a toy capsule vending machine. Great for rewards, party favors, treasure hunts, giveaways, contests, pinatas, sandbox and beach explorations! FIND IT FAST with these color-coded storage containers! Perfect as storage containers for tiny parts and screws! Use our vending capsules to store beauty supplies, parts and arts and crafts items. 100's of uses! 100% SATISFACTION GUARANTEE. Guaranteed Selection! Guaranteed Satisfaction! We strive to be the best at Friendly Customer Service! If you have any questions about this product by Avend, contact us by completing and submitting the form below. If you are looking for a specif part number, please include it with your message.